During the construction phase of the cement plant in 2009, Ohorongo took a deliberate stance to invest back into Namibia, targeting specific sectors such as Health, Education and Infrastructure Development. 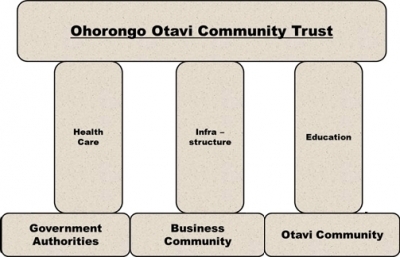 To enable this decision, the Ohorongo Otavi Community Trust (OOCT) was established, with the purpose to assist in the upliftment of communities and to contribute toward the general growth and development of Namibia. The OOCT has, through the years and with various projects, contributed significantly towards the development of communities, and will continue to do so through partnerships with government agencies and in partnerships with other institutions. Possible projects for a year are pre-identified and budgeted for accordingly. During the years of its existence, OOCT proved quite successful in winning partners from the local and national business community, non-profit organizations as well as private persons for the Trust’s cause. Throughout its existence a non-profit organization based in the German town Ulm Support Ulm e.V. has been a valuable partner of OOCT, sourcing much needed medical equipment that is contributing towards improving the public health services in Namibian. The Ohorongo cement plant has limestone resources for the next three hundred years. Thus, it is the sincere intention of Ohorongo to, for the next three hundred years, contribute to the socio-economic development and prosperity of all Namibians. Although this goal will not be reached overnight, every project concluded is one step closer to achieving the ultimate goal. The following projects are in consideration or in progress already. To complement the existing medical facilities and ensure excellent medical care in public health facilities, Support Ulm e.V continues to support Namibia with the supply of medical equipment through the Ministry of Health and Social Services. Shelter is a basic human need. A need we all share and when met helps in eradicating poverty as it is essential for a healthy and happy life. With this in mind, OOCT forged a partnership with Pupkewitz Foundation and First National Bank - Namibia Holdings Foundation Trust, in support of poverty eradication and the provision of community driven houses for low income households. The three private companies joined hands to enable the Shack Dwellers Federation of Namibia and the Namibia Housing Action Group (SDFN/NHAG) to build more houses, by pledging a total of N$ 9 million over a period of three years. The Shack Dwellers Federation creates the opportunity for Namibians to improve their standard of living. By taking personal responsibility, members are given the opportunity to build their own property which not only improves their standard of living but also creates personal wealth through the asset they have acquired. As a contribution towards poverty eradication, Ohorongo Cement, in partnership with the Built It group, established the Ohorongo Build It Brickmaking Academy. The academy provides brickmaking training for unemployed people and those who want to improve their skills in this trade countrywide. Through practical training supported by a fully explanatory booklet, which provides step by step instruction, trainees are guided to produce quality bricks. The aim is to create at least 600 jobs through this initiative. Hans-Wilhelm Schütte the Managing Director, Ohorongo Cement. Ohorongo Cement is a firm supporter of initiatives that uplift the Namibia people by associating our brand with activities which promise recurring benefits for generations to come. Through the partnership with the Ministry of Education, Ohorongo Cement donates cement towards education for the construction of additional classrooms, ablution and cooking facilities as well as relevant renovations at various educational facilities countrywide. Support Ulm e.V has contributed toward the construction of sleeping quarters for the Children Life Change Centre and Kindergarten (CLCCK), a non-profitable developmental organization in Windhoek. Frieda Nambuli, an orphan and victim of abuse, started the centre to care for and support orphans and vulnerable children in Windhoek. Over 70 children are accommodated at the centre and sleeping in corrugated iron structures, which serves as their home. Nambuli says she is doing this to protect the kids against society’s ills. We contributed building material and cement values at N$50 000 toward the construction of sleeping quarters.Over 70 children accommodated at the centre have been sleeping in corrugated iron structures which serves as their home. Social progression and Infrastructure development ranks high on Namibia’s national agenda. These are important foundations on which the development of any economy depends and without which Namibia’s Vision 2030 cannot be realised. Support Ulm e.V has played a vital role in the construction and revamping of various projects in Namibia. Challenges faced by the Namibian public health sector cannot be left to government alone. To support them, Support Ulm e.V. and OOCT have prioritized the health sector to make a contribution that is aimed at ensuring adequate health care for all. This initiative was launched when a group of medical doctors visited Namibia in 2009 by invitation of Ohorongo Cement’s largest shareholder, Schwenk Zement KG. The outcome of this very fruitful visit to Namibia was the signing of a five year Technical Co-operation Agreement between Support Ulm e.V., OOCT and the Ministry of Health and Social Services in 2014, which forms the basis of a number of OOCT projects. The agreement seeks for opportunities and projects aimed at improving the public health infrastructure and service in Namibia primarily through the provision of medical equipment by Support Ulm e.V. This generous support allowed for the renovation of the Otavi Health Clinic, the construction of sleeping quarters for orphans and vulnerable children at the Life Change Children Centre in Windhoek, as well as the construction of the Etunda Farm Clinic and provision of medical equipment to the clinic. 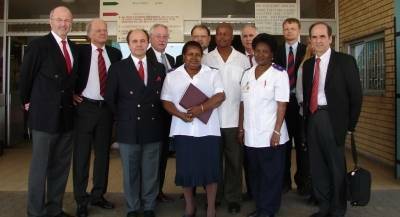 In addition to the donation of an ambulance to Otavi clinic, Support Ulm e.V. 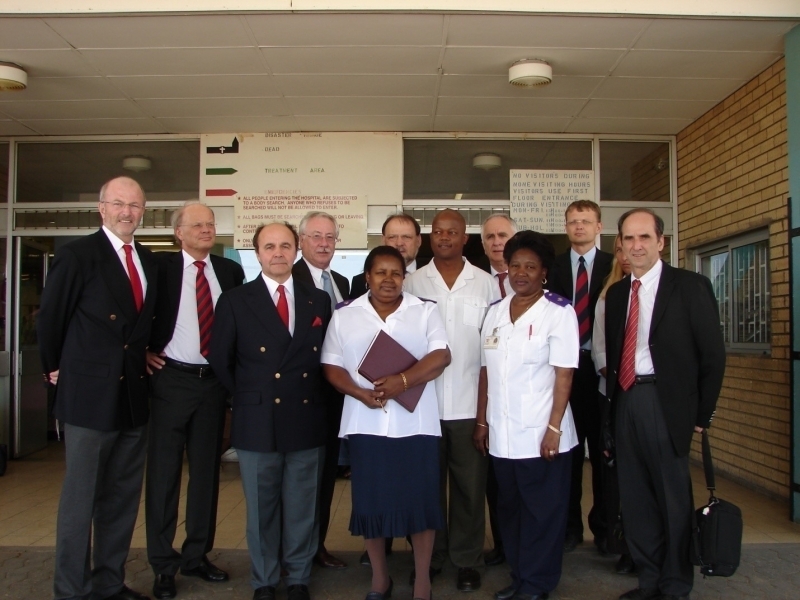 also made it possible for two German doctors to work at the Otavi Health Clinic for the duration of six weeks. OOCT, with assistance from Support Ulm e.V., also provide sun screen lotion, hats, long-sleeved shirts and sun glasses for people affected by albinism. Over the years, Support Ulm e.V. organized various fundraising activities to raise funds that is invested in various projects benefiting the Namibian population. Support Ulm e.V. remains a valuable partner in the sourcing and provision of medical equipment, and their generous support benefited several government and private medical institutions.